I've searched high and low for a good pizza dough recipe, and this one has never let me down. It's actually from one of my culinary school textbooks, which probably explains why it is trustworthy. The original recipe uses a scale to weigh out all the ingredients, but rarely have I found a kitchen scale in my friends or family's homes. So, I've done the math for you (yay!) and converted the recipe to volume measurements. I also swapped out the bread flour for all purpose flour....I just think it makes for a softer dough that doesn't get too chewy when reheating leftovers. If you want to make a big batch of dough and freeze for later, read the tips section for storage techniques. I've also comprised a list of my favorite pizza topping combinations. Do you have a favorite combo? I'd love to hear about it in the comments below! Step 1: In the bowl of a stand mixer, whisk together instant yeast and warm water. Step 2: Add the rest of the ingredients, and attach the dough hook to the mixer. Turn on low speed to mix together ingredients until the dough comes together (it will look very lumpy and rough). Step 3: Turn the speed up to medium-low and knead for 15 minutes. Keep an eye on the mixer because it will move around and creep towards the edge of the counter. When the dough is finished, it will look smooth and elastic. Step 4: Brush the inside of a large mixing bowl with olive oil or spray with cooking spray. Put the dough into the oiled bowl. Step 5: Spray one side of a sheet of plastic wrap with cooking spray. Cover the bowl with the dough with the plastic wrap, sprayed side DOWN. This will prevent the dough from sticking. Step 6: Place the bowl in a warm place, such as next to a window on a sunny day, or even outside if it's a warm day. Do not place in the oven...yeast will die over about 100 degrees F. You are aiming for about 80-90 degrees F. Let the dough rise until doubled in size, about one hour. Step 7: Unwrap, and punch down to deflate the dough. Step 8: Flour your counter liberally. Put the dough on the floured counter. Knead a few times with your hands. Step 9: Cut the dough in half. Step 10: Knead and roll each section into a ball. Step 11: Cover each dough ball with a wet paper towel and let them rest for about 10-15 minutes. Don't skip this step or you will be fighting the dough from shrinking when you roll it out! Step 12: Use your fingertips to flatten out the dough ball a bit to make it easier to roll out. Step 13: Flour your counter liberally again and use a rolling pin to roll out the dough ball to about 14" in diameter. Step 14: Transfer the pizza dough to a wooden peel or a metal sheet pan sprinkled with flour or cornmeal. I don't have a peel, so I used an extra large metal sheet pan without edges to use as pizza peel. This made it easy to slide the pizza off the pan and directly onto my pizza stone. Step 15: Top with sauce, cheese, toppings, more cheese, and bake on a pizza stone in the oven or grill at 450 F for a few minutes or until the bottom is crispy and the top edges are starting to turn golden brown. When I use my pizza stone in the grill, it only takes about 3 minutes. In the oven, it might take closer to 10-12 minutes. 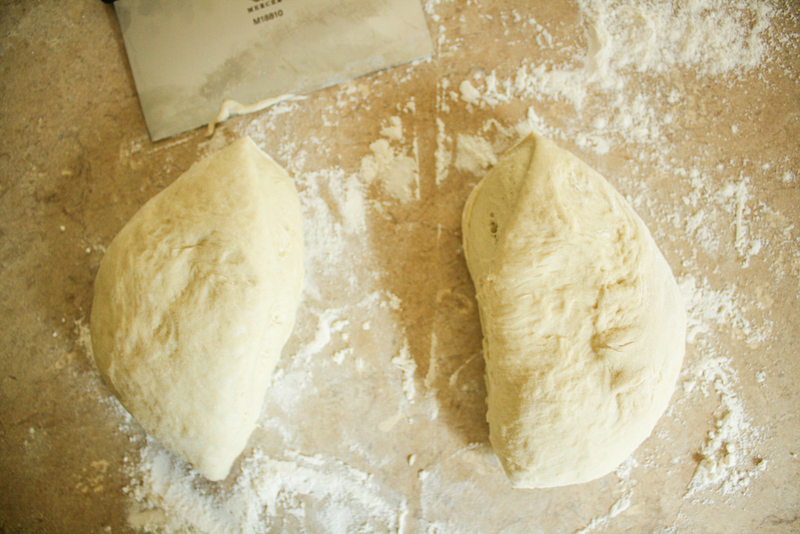 If storing for later use, you can do this right after you knead the dough the first time (step 3). 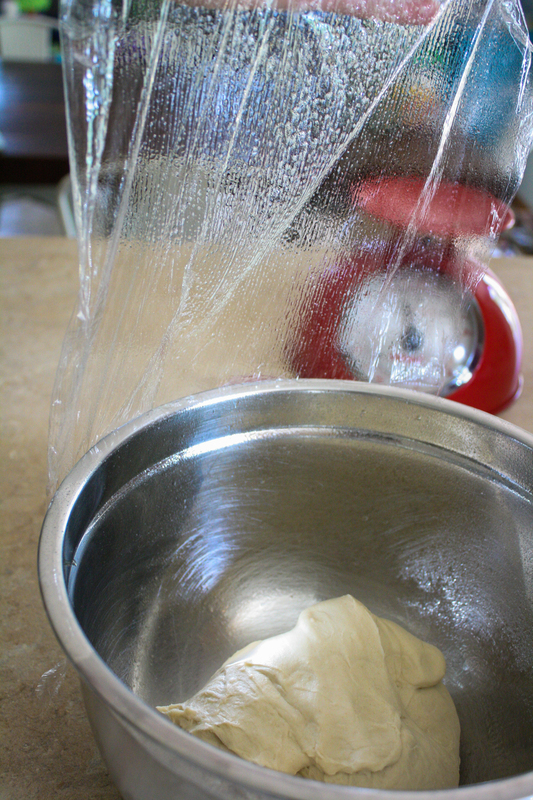 Freezer: Wrap the dough ball in plastic wrap sprayed with cooking spray and place in a freezer storage bag. It will last in your freezer for several months. When you want to use it, let it thaw at room temp for 2 hrs, then pick up where you left off, at step 4. Fridge: Do this only if you plan to use the dough the next day. Place the dough in a large bowl sprayed with cooking spray and cover the bowl tightly with plastic wrap sprayed with cooking spray on the side that will touch the dough. It will continue to rise very slowly overnight. The next day, continue the steps starting at step 7. Be sure to precook any raw meat toppings before adding them to the pizza. They won't have enough time in the oven on the pizza to fully cook. Have a favorite pizza combination I didn't list? Please share in the comments section below !